Summertime Fun Savings is Back! FREE Yoga in August! Posted June 12, 2017 Home / Ottawa Yoga Blog / Events / Summertime Fun Savings is Back! FREE Yoga in August! Our annual Summertime Fun Savings begins on June 15th! We’re always so impressed how dedicated our yogis are through the Ottawa winter, that when it comes to summer, we want to help you maintain the benefits of a regular yoga practice for health and vibrancy through the warm months. That’s why between June 15tht and July 31st, 2017, when you purchase a 10 or 20 class package or sign up for Auto-Renew, you’ll receive some FREE yoga in the month of August. The class packages you purchase are good for a year from the date of purchase, and the bonus classes are valid for use between August 1 – 31st, 2017. A 10 class package = 5 free August classes. A 20 class package = 10 free August classes. 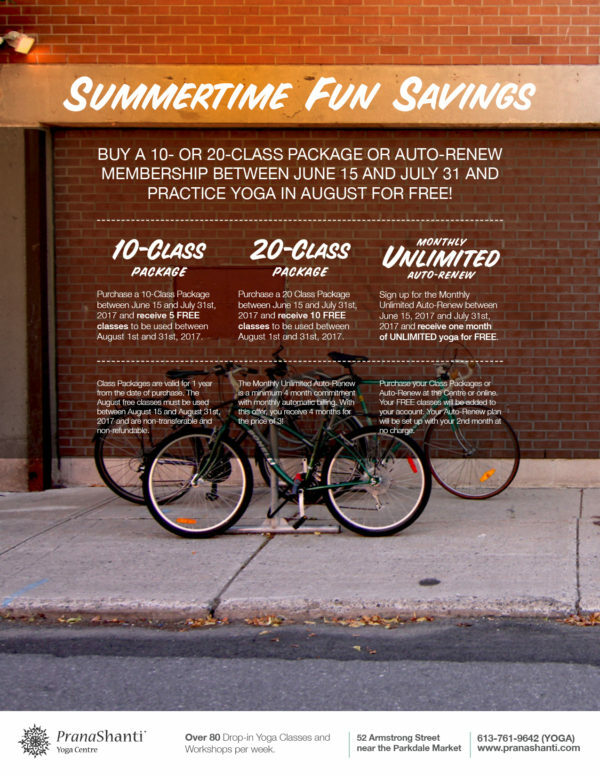 The Monthly Unlimited Auto-Renew (studio membership) in June or July = one month of free yoga. Because the Auto-Renew is a minimum 4 month commitment, you’ll pay for your first month at time of registration, and then your second month will be free, followed by monthly billing for the duration of your membership. You can purchase online or at the centre, and your classes will be added to your account. It’s a tremendous thing to get extra support in maintaining your practice! Yoga’s a little like regular tune ups and oil changes on your car: even if you do it really well one time, you’re going to have to go back to keep everything running smoothly. Tune up your soul and body this summer so you can paddle board, canoe, race, barbeque, and vacation in health and wellness. Question! Can the summertime savings special be applied to family packages? Thank you Jessica. We contacted you directly. Thank you for your question and we look forward to you being part of the Summertime Fun Savings! Hello Andrea, we’ve contacted you by email, but please let us know if yo have any other questions!